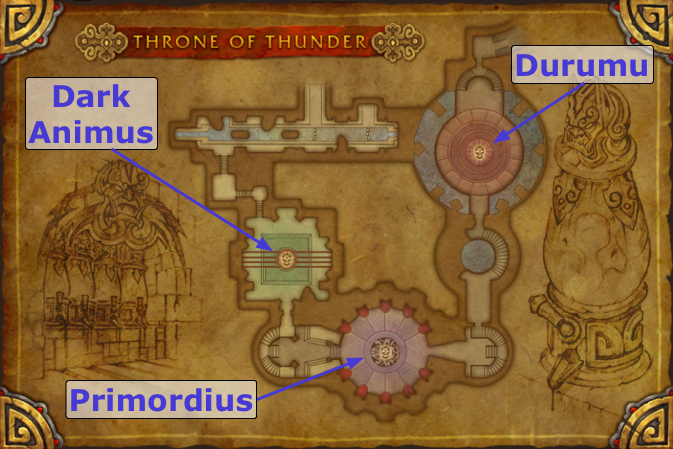 The Throne of Thunder is a raid instance introduced in World of Warcraft Patch 5.2. The encounters can be performed in 10-man and 25-man formats, as well as in LFR format. The 10 and 25-man formats also have an unlockable heroic mode setting, as well as a heroic-only boss (which is not available in normal mode). This raid represents Tier 15, in terms of progression, and it is intended to be the second raiding tier of the Mists of Pandaria expansion. 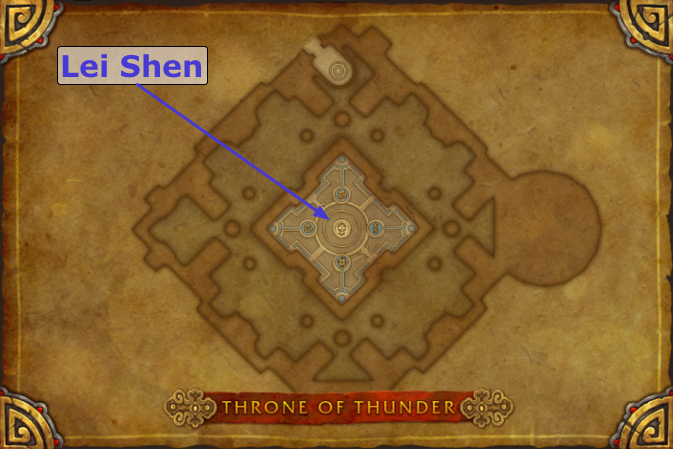 The entrance to the Throne of Thunder is located in the north-western part of the Isle of the Thunder King, and it can currently be accessed via a portal located near to the Shado-Pan Garrison in Townlong Steppes. 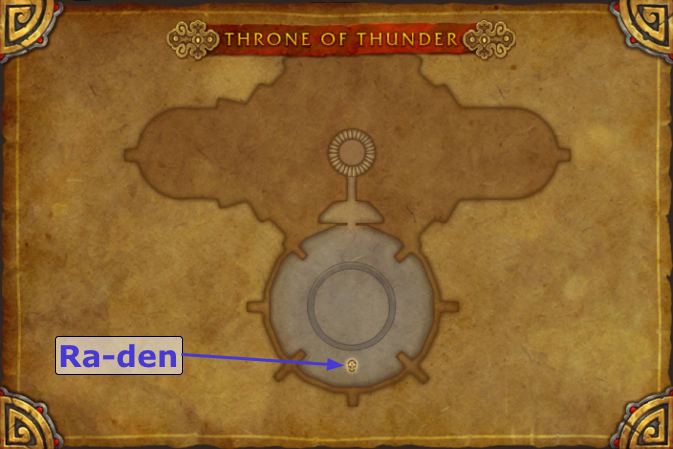 Entry into the raid instance is currently done through a side entrance, located on the left of the main path that leads up the instance. 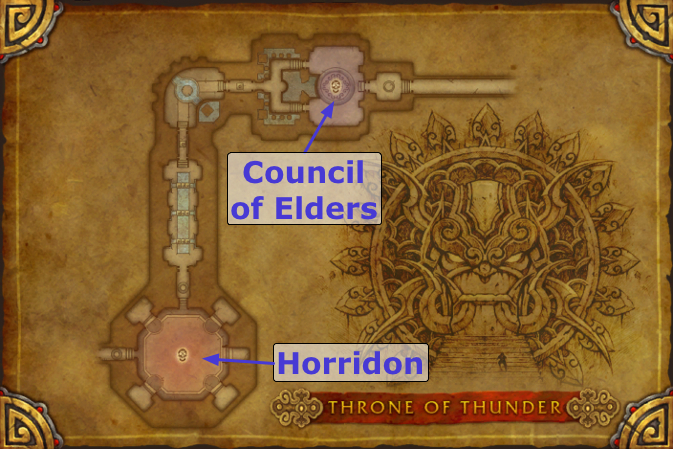 The raid instance houses 12 boss encounters (13 if you count the heroic-only boss we mentioned above). Shortly before the raid is released, we will be making our written guides for the bosses available. Until then, we have created video previews for the bosses, that will give you an idea of what the fight is like (and most often, they will actually provide you with ample details of the mechanics). 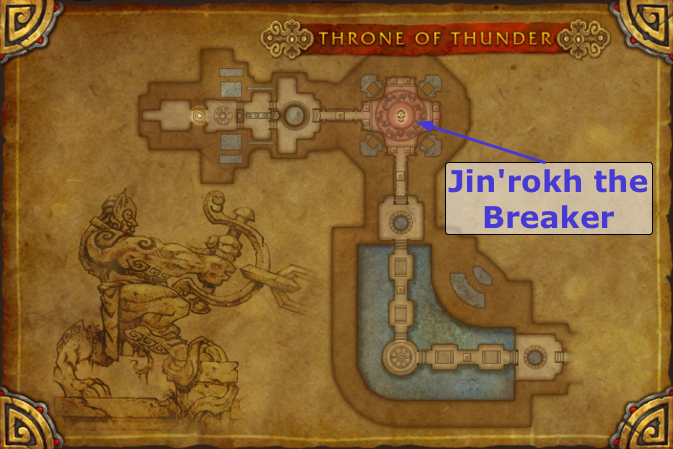 Jin'rokh the Breaker is the first boss of the instance. This is a single-phase fight of relatively low complexity. It is mostly about proper positioning and movement, and about proper timing of DPS cooldowns. After your raid defeats Jin'rokh, you must fight and defeat Horridon, as well as his master, War-God Jalak. This fight has several phases, and your raid will have to handle a plethora of different adds. The next encounter is against the Council of Elders. You will fight 4 Troll bosses simultaneously. Your raid will need to deal with a large variety of mechanics. Also, at certain times, each of the bosses becomes empowered for a while, which alters their abilities somewhat. The fourth boss of the instance is a giant turtle called Tortos. This is another relatively simple fight (like Jin'rokh the Breaker), during which your raid needs to defeat the boss and a large number of adds. The fight presents an interesting new mechanic, and it should prove to be a generally enjoyable fight. 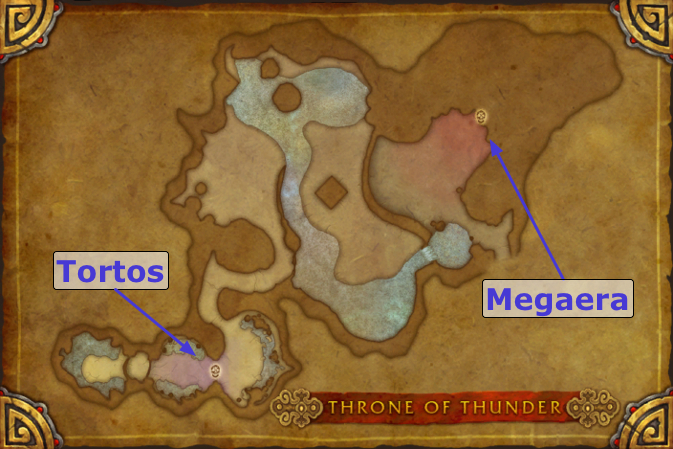 Once Tortos has been killed, your raid can move forward and face Megaera, the 5th boss of the instance. This is a multi-headed hydra (technically a corrupted Cloud Serpent), and the encounter is extremely challenging. The difficulty of the fight ramps up continually, making for a very climactic last few minutes. 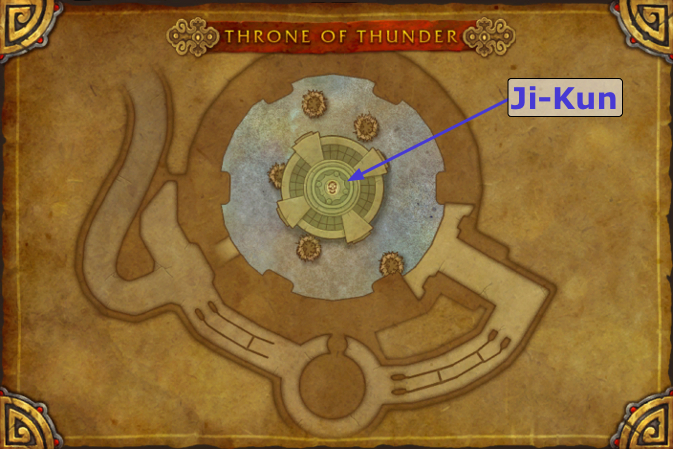 Ji-Kun is the 6th boss of the instance. This fight is heavily reminiscent of Alysrazor in Firelands. The fight is not complicated in terms of mechanics, but it should still prove to be a lot of fun. The 7th boss of the instance is Durumu the Forgotten. The boss is essentially a giant eye, and the fight presents an extremely creative mechanic that, as far as we can remember, has not yet been used in any previous encounters in the World of Warcraft. It is a rather strenuous fight, and your raid members will need to all perform very well to defeat the boss. Once Durumu has been killed, your raid can access the next boss, Primordius. This powerful Saurok is one of Lei Shen's failed experiments. On the face of it, the fight appears extremely complex, but it is actually quite easy to understand. It is a rather pressing DPS race, and your raid will get to enjoy having many of their stats buffed, provided that the strategy is correctly executed. The 9th boss of the instance is a very strange encounter against the Dark Animus, a mechanical construct. Before you can engage the boss himself, you will have to defeat a number of smaller adds. The fight is quite chaotic. 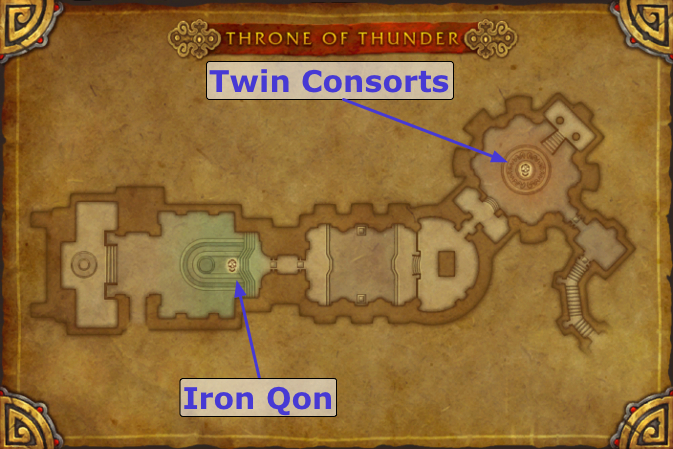 Iron Qon is the 10th boss of the instance. This powerful mogu rides his three Quilen Champions into battle, one after the other, and then fights you on his own after his Quilens have been killed. This is another intense, but extremely enjoyable fight. The penultimate encounter of the instance is against the Twin Consorts, Lu'lin and Suen. The encounter bears many similarities to the previous twins fights, but also adds several new and innovative elements. Finally, your raid will get to fight Emperor Lei Shen himself. The fight against him is long, complex, and quite difficult, just as you would expect of a fight against the final boss of a raiding tier. Once you have defeated Lei Shen on Heroic difficulty, you will be able to access a 13th boss, called Ra-den. Not much is currently known about this boss, other than the fact that he is a Titan keeper, and that he is obviously hostile towards your raid. Killing bosses in the Throne of Thunder will grant you reputation with the Shado-Pan Assault. Increasing your reputation with this faction will allow you to buy gear from Ao Pye at the Temple of Niuzao. Every boss you kill in the Throne of Thunder rewards you with 300 reputation (Ra-den gives 500 reputation). The weekly Champions of the Thunder King quest gives you an additional 300 reputation a week. Also, at exalted, you will be able to buy a Shado-Pan Assault Tabard. 21 May 2013: Patch 5.3 update: changed reputation requirement for Waist and Chest items. 13 Apr. 2013: Added zone drops. 07 Mar. 2013: Removed the mention to Grand Commendation of the Shado-Pan Assault, which seems to be no longer available in the game.